Planaria are a non parasitic flatworm of the class Turbellaria. The fresh water animal that we come across in our Aquariums is a subclass species Dugesia.They are primary carnivorous, but are also known to be scavengers eating detritus and other decaying organic matter. Planaria are not hunters and prefer dead or dying pray as well as fish eggs. Planaria are hermaphroditic and carry both male and female organs, they do re produce sexually. These animals more commonly re produce a sexually by a method called TRANSVERSION FISSION. The Planaria will anchor itself by the tail and literally pull itself apart. Over a period of several days the tail section will grow a new head and the head section will grow a new tail. If the animal has a good food source this re production method can be repeated many times. Science has shown that planaria can be dissected up to four separate parts and each section will develop into a full animal. 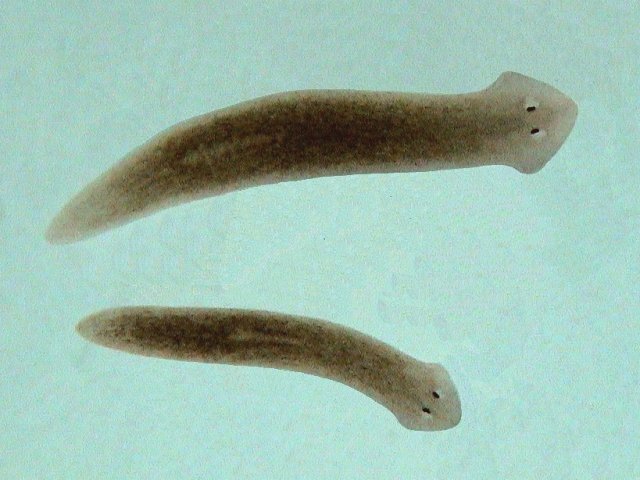 Scientists have also shown that if you divide a planarian's head in two, lengthwise, two heads will develop and the animal will continue life with two heads. The body of a planaria is non segmented ,The head is triangular shaped and contains two eye spots that detect light, planaria are light sensitive and usually haunt dark areas, and will venture out at night to feed. Many people claim that planaria are harmless in small numbers and are just an eyesore as they are not active hunters, therefore presenting a very small threat to active shrimp and fish, preferring to feast on the sick and dead. Most aquarium keepers would rather not have them around because of the fear of their re production abilities. 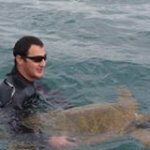 There are several ways that can be put into action to rid the aquarium of these little creatures. The most common methods are listed here. One of the easiest and non invasive ways, is to keep your tanks clean, vacuuming up all uneaten foods and cleaning the substrate of any detritus, no food no planaria. Many people opt to tackle the problem by chemical warfare! The most common option is the use of a dog de wormer containing FENBENDAZOLE! the agreed upon "Safe" dosage of Fenbendazole is 0ne gram per 38 litres ( ten gallons) Be sure to remove any carbon that may be in your filters as it will absorb the chemicals defeating the purpose of dosing the tank. Another method is to build a DIY planarian trap, many ideas for a trap can be found online for example. This trap uses a test tube from a test kit and a small length of air hose. Drill a hole in the lid of the test tube the same size as the air tube push a piece of airline tubing through the hole making sure that the tubing is suspended in the middle of the test tube.bait the trap with a small piece of meat, fish or shrimp etc. submerge the trap and wait check after a couple of days, remove the planaria re bait and set the trap again. I know this is an old post but it's a great and easy to understand explanation. I'm battling planaria in two of my shrimp tanks and have reduced their numbers by being more cautious on amount of food being fed and what's left uneaten. I've ordered planaria zero from Jamie Newbreed and going to try that in my most affected tank where I had a few shrimp deaths and will see how it goes.